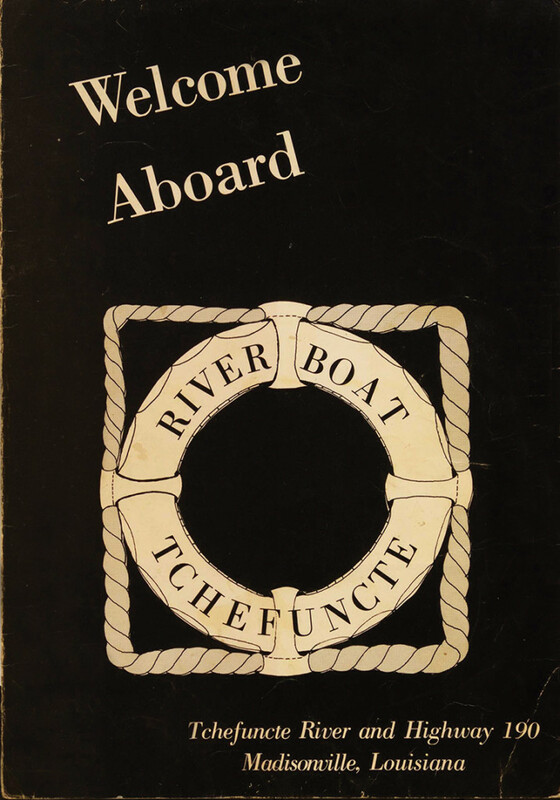 Did your mother-in-law ever mention the famous chef/owner or that the restaurant Riverboat Tchefuncte was acutally a barge moored on its namesake river in Madisonville? The vessel, which had been converted into the Riverboat Tchefuncte restaurant, was a not a once-grand paddle-wheeler as its name might imply – it was a cargo barge the Nashville Bridge Company had built in 1939 as CBC-701. The similarly-named diesel pipe line dredge Tchefuncta had served the Jahncke company since about 1930 and appears to have still been working when the restaurant was created. Although also based in Madisonville, the dredge Tchefuncta and the barge-based restaurant were two different vessels. The Riverboat Tchefuncte’s owner and chef, René Nicolas, formerly served as Executive Chef at the Roosevelt Hotel, which was justifiably proud of having recruited him in 1962. An internationally-known chef, Nicolas had previously worked for famed Parisian restaurants Maxim’s and Le Crillon. A decade after his New Orleans debut, Nicolas launched his own floating seafood restaurant moored on the shore of the Tchefuncte River at Highway 190 in Madisonville, dubbing it the Riverboat Tchefuncte. The restaurant garnered a loyal following but was later sold and moved to Killian, where it operated as the Riverside Tavern and Oyster Bar; it sank at its mooring in January 1990. In the mid-1970s, Jacquee Leone opened an antique store at 834 Chartres but soon converted the space into The Soap Gallery. The store specialized in high-quality brand-name European and domestic soaps and grooming supplies, most of which were made with pure essential oils and botanical extracts. A second location soon opened in Uptown Square, a new shopping center, which had opened at Broadway and Leake in 1977. It is that location which I remember best, perhaps because the incredible scents wafting though the store did not have to compete with French Quarter aromas of a less appealing nature. Send your question to: Julia Street, c/o New Orleans Magazine, 110 Veterans Blvd., Suite 123, Metairie, LA 70005 or email: Errol@MyNewOrleans.com.